Matthew Flisfeder from the University of Winnipeg has penned a nice essay for the The Conversation on Oculus and our troubles with (virtual) reality. He starts with the new Oculus Go that brings virtual reality hardware down in cost to US $199. He then goes on to talk about fake news and alternative facts and how the portrayal of VR in popular media (Neuromancer, Matrix) has generally questioned the impact of the new media as it creates an alternative or fake reality. He also makes an interesting connection between fake news, social media and VR. Much of the discussion of the distorting power of fake news has focused on social media like Facebook and Twitter and how they seem to have manipulated the political reality for many. Facebook has become the site of internet reality for so many that when it distorts things it is people’s news of the world that is distorted. Facebook has ceased to be just one web site among many for the many becoming the platform for reality that frames what can be reality. Which raises the question of what they will do the VR hardware they control? 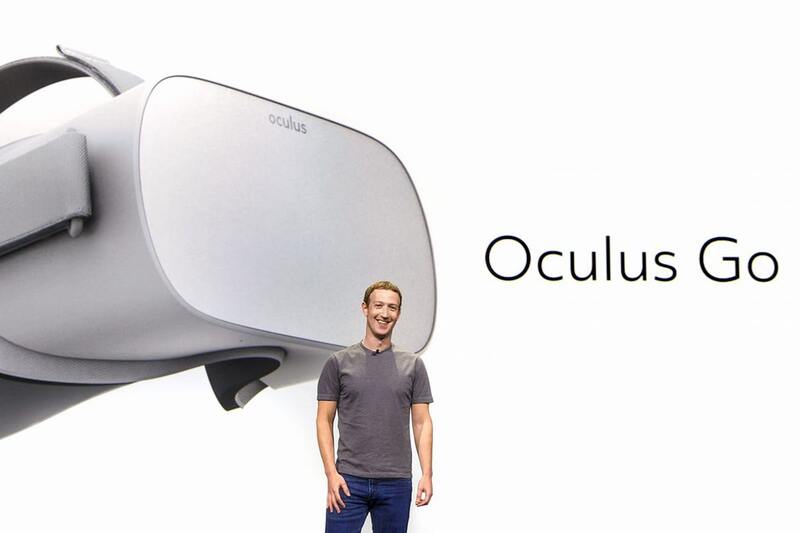 How does the Oculus Go fit with Facebook? Could Facebook become the operating system a social reality you experience virtually? Could it become so immersive you don’t bother with alternatives? Stanford has put up a video of a talk on why you should Quit Your Technology Job and Get a Humanities Ph.D.. The talk is by Dr. Damon Horowitz who did just that. He quit doing AI and got a Ph.D. in philosophy. He argues that it has given him perspective on what AI can and can’t do, in addition to helping him think about his life and some of the things that make him uncomfortable about the tech world. It isn’t a ground breaking talk, but it is delivered with humour and addresses technology folk where it matters. Are you really that happy with your job and the hype around what you do? Thanks to Humanist for this. In response to the US president, Wolfenstein’s marketing used his own words to market the game: “Make America Nazi Free Again”, “There is only one side”, “These are not ‘fine people’”, and so on. Many of his supporters have taken exception to this, decrying the notion that Nazis support the current occupant of the Oval Office. Unfortunately, the fact that white supremacists and actual Nazis support Trump and march openly in America doesn’t help their claims. The Guardian and others have stories about how the marketing of Wolfenstein II: The New Colossus has angered Trump supporters: Nazis as the bad guys in videogames? How is that controversial? The issue is partly how Wolfenstein adapted Trump’s slogan “Make America Great Again.” Alt-Right gamers would like games to not be political, but they always have been; it’s just that certain demographics weren’t bothered by the politics before. The larger story is how the gamergate community began to affiliate with the alt-right. Motherboard has a story about the shift in the r/KotakuInAction (KiA) subreddit. So where does that leave Gamergate? Some people within the community are embracing the alt-right, others are peeling off in disgust, and most, it seems, continue to deny the link vehemently while paradoxically allowing that ideology to supplant Gamergate’s identity. Cross, who even some Gamergaters would now agree was right about the nature of the movement from the very beginning, thinks that it’s going to be completely absorbed by the greater alt-right, and that this process has already begun with KiA essentially becoming a sub forum of r/The_Donald. The standard around which Gamergate organized—fighting for video games—is no longer the driving force behind KiA. The Atlantic has a good article on What Facebook Did to American Democracy by Alexis C. Madrigal (Oct. 12, 2017). What is interesting is how we assumed that the net and social media could affect things and that is would naturally benefit the left. The story of networked politics seems to be that of tactics being developed by the left and promoted as democratizing and inclusive that are then reused by the right. It is also the story of how Facebook decided to own news and fake news. They created filter bubbles so that none of knew what the other was thinking. From Humanist I found out that the University of Bologna, one of the oldest universities in the world, is inaugurating a degree in Digital Humanities and Digital Knowledge (DHDK). The official web site for the two year MA is here. The programme will be in English and the Programme Director is Dr. Francesca Tomasi. I love the idea of an inauguration of a programme. From the programme of the inauguration, it looks like a nice set of events/talks too. From Teaching in a Digital Age by A. W. Bates I came across this 1954 video of Skinner explaining his Teaching Machine inspired by behaviourism. The machine runs a paper script, but it isn’t that different from the computer based drill training today. You get a question, you write your answer, and you get feedback. Later we got machines that projected slides and hypertext systems. See Programmed Instruction and Teaching Machines. Professors need to scare their students, to make them feel they’ve been given the skills not just to get rich but to wreck lives; they need to humble them, to make them realize that however good they might be at math, there’s still so much they don’t know. This year I kept notes about the Digital Humanities 2017 conference at McGill. See DH 2017 Conference Report. My conference report also covers the New Scholars Symposium that took place before. The NSS is supported by CHCI and centerNet. KIAS provided administrative support and the ACH provided coffee and snacks on the day of. We were lucky to have so many groups supporting the NSS which in turn supports new scholars to come to the conference and to articulate their issues in an unconference format. We had an opening keynote in French from Marin Dacos. He talked about the “Unexpected Reader” that one gets when publications are open. We had a great closing keynote by Elizabeth Guffey on “The Upside-Down Politics of Access in the Digital Age” that asked about access for disabled people in the digital realm. 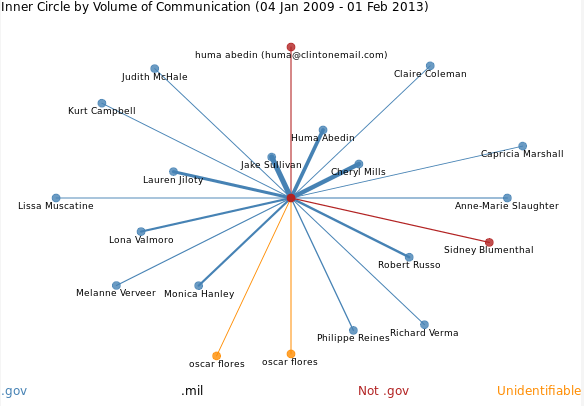 Thanks to Sarah I was led to a nice custom set of visualizations by Salahub and Oldford of Secretary Clinton’s Email (Source: Wikileaks). 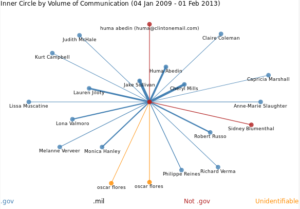 The visualizations are discussed in a paper titled Interactive Filter and Display of Hillary Clinton’s Emails: A Cautionary Tale of Metadata. Here is how the article concludes. Finally, this is a cautionary tale. The collection and storage of metadata from any individual in our society should be of concern to all of us. While it is possible to discern patterns from several sources, it is also far too easy to construct a false narrative, particularly one that ﬁts an already held point of view. As analysts, we fall prey to our cognitive biases. Interactive ﬁlter and display of metadata from a large corpus of communications add another tool to an already powerful analytic arsenal. As with any other powerful tool it needs to be used with caution. Their cautionary tale touches on the value of metadata. After the Snowden revelations government officials like Dianne Feinstein have tried to reassure us that mining metadata shouldn’t be a concern because it isn’t content. Research like this shows what can be inferred from metadata.